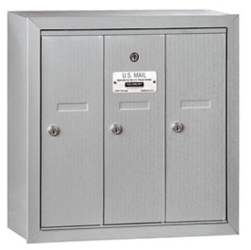 U.S. Mail Supply specializes in heavy duty, locking metal mailboxes for indoor and outdoor placement on residential and commercial properties in Illinois and throughout the United States. In addition to offering best possible pricing on a wide range of mailboxes, we also provide expert advice on mailboxes. 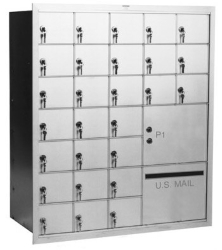 Whether you need a large, multi-tenant mailbox for a big office building or a single wall mount mailbox for a small business, U.S. Mail Supply gives you plenty of options. We carry both USPS approved mailboxes and private use only mailboxes. For USPS approved horizontal STD-4C mailboxes and 4C pedestal mailboxes for private delivery, U.S. Mail Supply delivers. Choose from front and rear loading options and surface or recessed wall mount options. Our USPS approved mail boxes meet all U.S. Postal Service standards for box size, accessibility and identification information. They all include clear installation instructions to ensure full compliance with USPS regulations for height and distance from the curb. 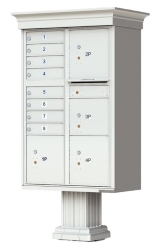 From retro Victorian style pedestal mount units to standard 4C horizontal mailboxes for indoor installation, US Mail Supply has secure mail box solutions for multi-unit buildings of all sizes. Our products include both USPS approved and private delivery options. US Mail Supply has a great selection of USPS approved and private use outdoor pedestal mounted mailbox units and mail kiosks. Available in colors to complement virtually any building's color scheme. 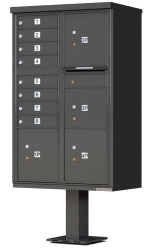 US Mail Supply carries horizontal and vertical mailboxes for indoor mounting in multiunit residences and office buildings, many with customizable options for outgoing mail slots and larger doors for packages. 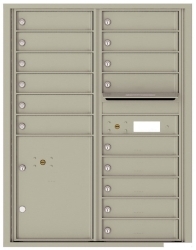 US Mail Supply offers a range of options for residential mailboxes, including wall-mounted models and locking mailboxes designed to be mounted on a post. 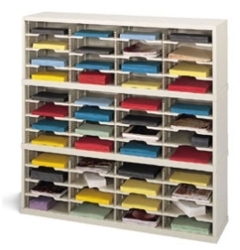 Mail sorters, literature organizers, paper stock filing systems—whatever you use them for, mail sorters perfect for mailrooms, offices, hospitals, classrooms and more. We carry vertical and horizontal mailboxes, both pedestal mounted and wall mounted, as well as free standing mail drop boxes. We have mailboxes for apartments, condos, government and municipal buildings, educational institutions and businesses of all types. In addition to USPS approved mailboxes, we also carry mailboxes for private use in a range of styles and colors to complement any architectural style or color scheme. US Mail Supply offers a wide range of American-made metal mailboxes built to withstand the extremes of Illinois weather. 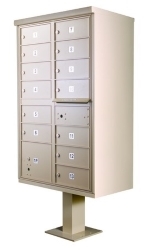 Pedestal or wall mount, our lockable mailboxes keep mail and belongings safe from pilfering hands. If you’re not sure which mailbox will work best for you, give us a call and one of our mailbox experts will walk you through your options and make a recommendation. 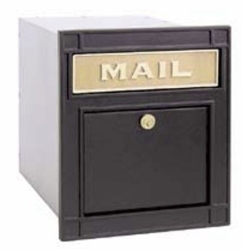 Many of the indoor and outdoor mailboxes we carry can be customized to fit your space. A great way to visualize how mailboxes will work in your building is with a little help from our designers. Click on either link below and fill in some details about the type of mailbox arrangement you want, then we’ll provide you a drawing of how your mailboxes will look when installed, along with a quote.